Comments are a great way to increase user engagement on your website. But how do you get people to comment on your articles? There is no one answer to that question, but one thing is certain that you need to make an effort. You can start by styling your comment layout and improving your WordPress comment form to make them look more appealing. In order to get more people to comment, you need to put yourself out there, and ask users to participate. One of the ways you can do that is by having an interesting comment prompt. Most WordPress sites have a boring ‘Leave a reply’ title above comments form. You need to jazz it up a little and be creative. In this article we will show you how to add a custom comment form title in WordPress. 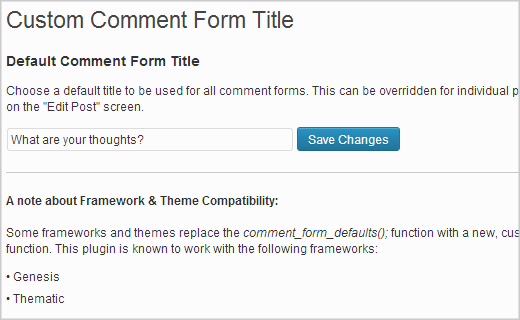 First thing you need to do is install and activate the Custom Comment Form Title plugin. After activating the plugin, go to Settings » Custom Comment Form Title. On this page you can change the default comment form title. Change it to something more interesting. Not all posts and articles on your website are the same. Depending on your content, you can use your comment form title as a call to action. This plugin allows you to customize your comment form title for each post. Go to Posts » Add New and you will notice a new custom comment form title meta box. Be creative with your comment prompts and use titles that show your users how much you value their comments. At WPBeginner, we sometimes even write articles to answer questions asked by our users in comments. You need to participate in the discussion by replying to user comments and improving the quality of discussion on your site. To engage users in the discussions, you can enable users to subscribe to followup comments and your newsletter. 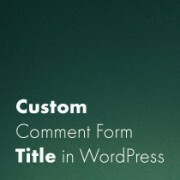 We hope that this article helped you add custom comment form titles to your WordPress posts. Do you have a creative comment title? Please share it with others in the comments below. great, that’s a good idea! This is great! I honestly hope this adds to interactions on my site!